How to Measure Color Fastness to Rubbing? Rubbing color fastness is one of the important characteristics for good apparels. Here is some information about rubbing color fastness. This may help you make a further step into improving your apparel product quality. Rubbing color fastness refers to ability to sustain original color of dyed fabrics when rubbing. Dry rubbing color fastness refers to the situation of fading and staining of dyed fabric when rubbed with standard white cloth. Wet rubbing color fastness refers to the situation of fading and staining of dyed fabric when rubbed with standard white cloth which water content is 95% to 105%. The evaluation of Rubbing color fastness depends on the degree of staining of white cloth. After testing, the white cloth is compared to staining sample cards to measure staining fastness. Rubbing color fastness, same as washing color fastness, divide into 5 grades and 9 files, among which grade 5 is the best and grade 1 is the worst. The friction fading of fabric is to make dye fall off caused by friction. Wet rubbing is influenced by both external force and water, so it is about one level lower than dry rubbing. Crockmeter (Figure 2), Gray Cards Evaluating Staining, Standard Cotton adjacent fabric (50mm*50mm uses to circular friction head; 25mm*100mm uses to rectangular friction head), Sample to be Tested. If tested sample is fabric or carpet, you must prepare two groups of samples with no less than 50mm*200mm, and each group contains two samples. One group is the length direction of samples is paralleled to warp yarn, used to dry rubbing and wet rubbing in warp direction; the other is the longitudinal direction of samples is paralleled to weft yarn, used to dry rubbing and wet rubbing in weft direction. If the sample is multi color, you should choose sample’s position carefully and let every color rubbing. If the area of each color is large enough, you must take all samples. If tested sample is yarn, you have to weave it as a fabric and ensure its size in no less than 50mm*200mm; or yarn is winded parallelly in a paperboard whose size is same as tested sample. Rubbing cloth should adopt cotton semi-finished fabrics which have been desized, scoured, bleached and do not contain any finishing agent. Tested sample is fixed on the bottom floor of the tester by clamping device, and its length direction is in accordance with the movement direction of the tester. Dry rubbing cloth is fixed on friction head of tester, and the warp direction of it is in accordance with the movement direction of friction head. Press Start Switch, reciprocating rub for 10 times in 10s (reciprocating movement is 100mm, the vertical pressure is 9N), then take the dry rubbing cloth off. Taking another rubbing cloth, and rolling it on rolling fluid device after soaked in cool water, to make moisture content controlled in 95% to 105%. To do the above operation of dry rubbing cloth repeatedly. When rubbing is finished, dry it at room temperature. Using gray cards evaluating staining to measure the staining fastness of above dry and wet rubbing clothes. 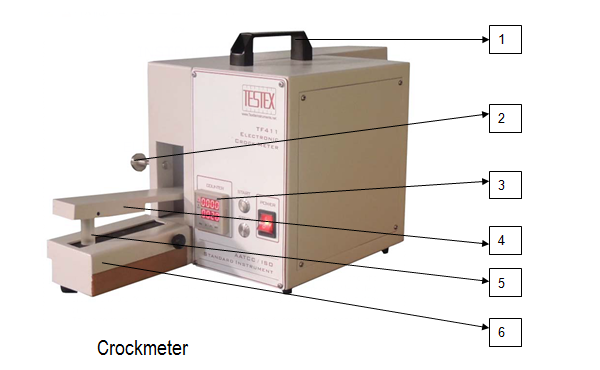 Crockmeter (manual type and automatic type) is usually used in Rubbing Color Fastness Test. This is a guest submission from Nancy Cao from Testex. Online Clothing Study: How to Measure Color Fastness to Rubbing? Color fastness to rubbing testing process using Crockmeter.